Presenting the brand new Extreme Flight 74" Laser EXP V2! The Laser EXP has exploded onto the scene in recent years and now we are releasing the next evolution of this design, the V2! By strategically implementing composite G10/ply laminate, carbon stringers and spars we've been able to reduce material thickness substantially allowing us to reduce weight while adding strength and rigidity. We've modified the design to require only a single elevator servo thus further reducing overall weight. We've also implemented the self jigging stab/elevator installation that has become so popular among our customers assuring a hassle-free, easy and accurate assembly. We've added the gorgeous printed scheme from our 91" Laser EXP and also offer the traditional Loudenslager scheme that is so much a part of the Laser legend. 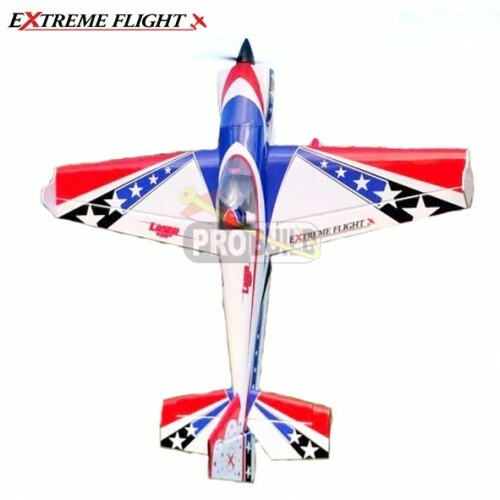 As many have discovered, the Laser EXP may well be the ultimate aerobatic RC model, excelling in precision, XA and old school low and slow 3D maneuvers. Find out for yourself what the Laser EXP can do for your flying skills. Wing Area: 1150 sq. in. Qty. 4 full size, metal gear hi-torque servos. MKS HV-1220 recommended.